All maple syrup producers have a favourite tree - a champion tree! It is usually a mature healthy tree of substantial diameter (in excess of 50 centimeters) that produces voluminous quantities of sap with a higher concentration of sugar than other maple trees in the forest. My present champion has a 30 degree hook at eye level and breaks off into two equally sized branches reaching to a height of approximately 16 meters. It's a modest champion by all accounts - producing two full two gallon buckets of sap with 2.8% sugar content on a good day. My neighbour's champion tree sits in a preferred location in full sunlight in the corner of a field on the edge of his sugarbush. It's a tree of some renown since one March day in 1973 it produced 12 gallons of sap, a feat not likely to be repeated since farmers these days rarely hang more than two buckets on a tree. When asked about the tree's longevity and prolificness my neighbour replied, "We only ever tapped that tree one day to see what it would do." These trees pale by comparison with what is reputed to be Canada's oldest sugar maple tree. The Comfort Tree stands on a quarter acre plot near North Pelham Ontario and has been under the protection of the Niagara Peninsula Conservation Authority since 1961. 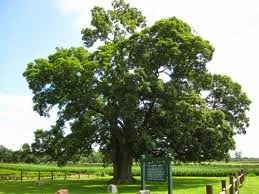 Nicknamed "Old Glory" by its original owners, the 500 year-old tree is 25 meters high and has a circumference of 6 meters. It's a sure bet it hasn't been tapped in years as it was reserved for everlasting protection by the Comfort family in 1946. Since the volume of sap a tree produces is often directly proportional to the number of leaves it has … can you imagine the volume of sap this tree might have produced in its day? Do you have a story to tell about your favourite tree or your champion maple tree?